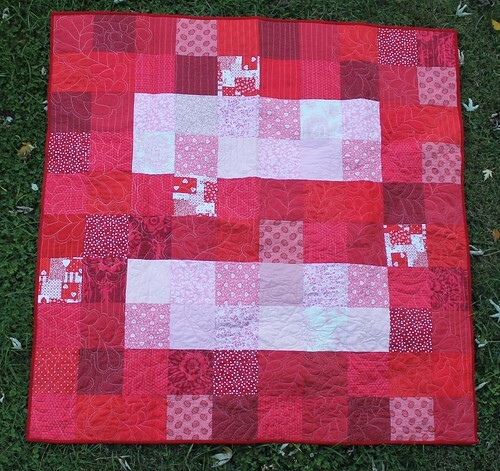 I finished my Love Quilt – started in a tizzy the day that the Supreme Marriage decided in favor of marriage (!) and finished in the drudge of day to day. I love examples of political crafting from American history and gee I guess I’ve joined in! 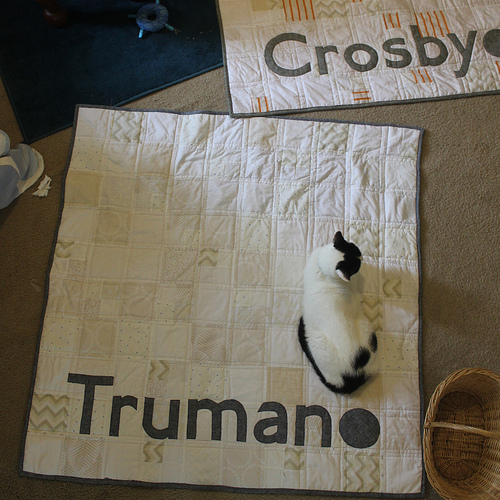 There are a lot of similar quilts and cross-stitches, etc. out there and I think it’s lovely. 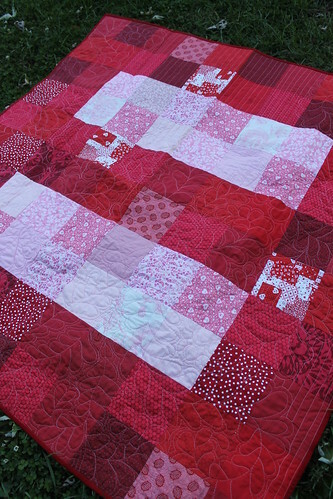 I wanted to use really romantic feathers over the squares – which use a lot of sweet valentine and floral fabrics. 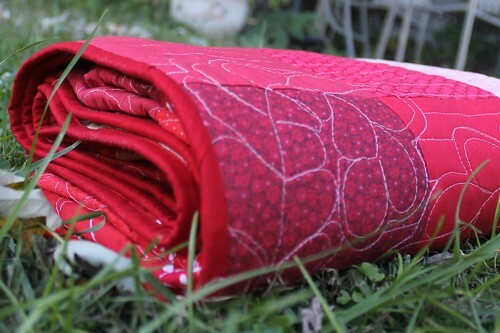 This required remembering how to do feathers, which I have been too intimidated to do since a quilting class I took about 4 years ago…I think I remembered ok! I want to do more feathers, they are a joy. However, the feathers started to get busy feeling, so I threw in some straight lines. 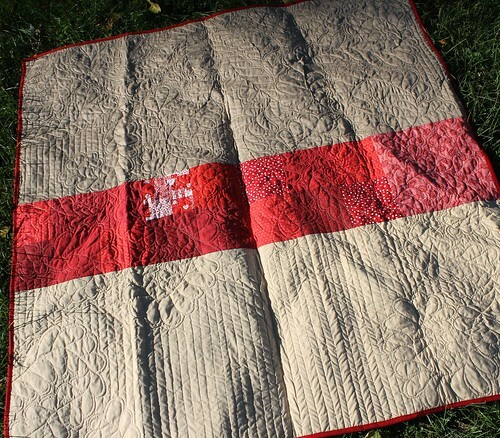 I actually free motion quilted a lot of the lines (I marked with a hera marker) so that I could squeak them into spaces between the feathers. I wanted it to look kind of like vines hanging on a trellis. 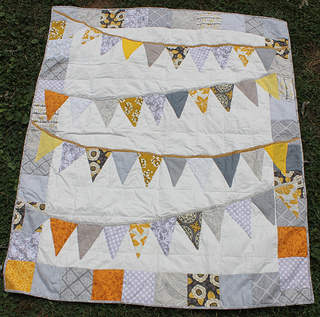 I am offering this up for sale in my etsy shop, in part because I simply don’t have room for any more quilts in the house. Though I admit, the cats have been especially fond of this one, I keep having to stick it on higher shelves and they keep finding it to curl up in. 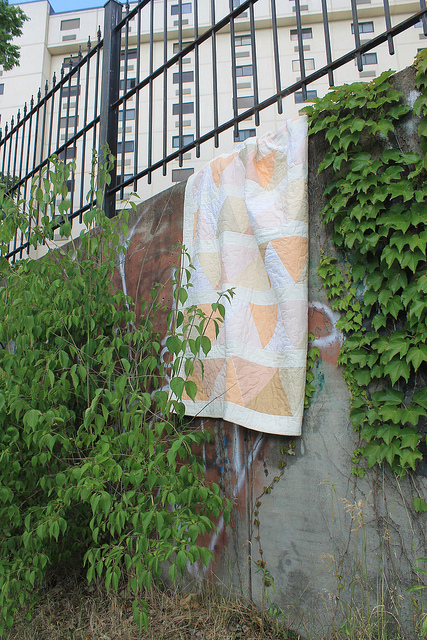 Oh and I linked up with Fabric Tuesday – lots of great projects happening. I love how you combined the feathers with the straight lines. I think it gives the feathers a more modern feel. 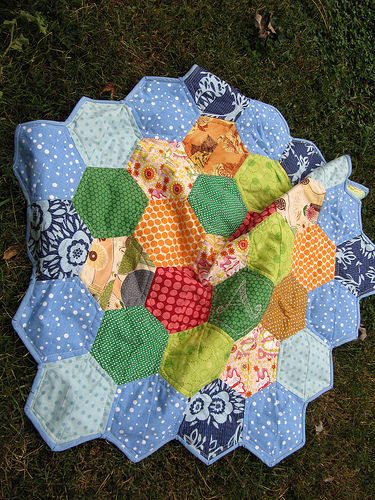 What a great quilt both in meaning and beauty! 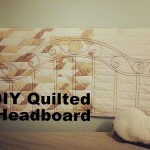 I love how you made the sign in patchwork — great idea! Love it!